The National Aeronautics and Space Administration, concerned that people in the social networking generation have not shown enough interest in its work, has renovated its Web site to appeal more to the 18- to 25-year-old set. The site, introduced over the weekend, has new blogs and widgets and more ways for people to view and manipulate content. A MyNASA feature has a “top playlist” that lets people watch clips of the space shuttle Discovery’s return to Florida or the California wildfires viewed from orbit. The site, which has not had major overhaul since early 2003, still has information for policy makers and the media, but also more diversions. It is meant to compete with sites like Space.com (run by a company called Imaginova) and CNN, both of which have had more sophisticated presentations on space exploration. “Younger folks look at the Web a different way,” said Brian Dunbar, Internet services manager for NASA. “They want to be able to pick and choose.” He estimates that the NASA site gets about a million unique visitors a month. Many of the new features, like better feeds to users of aggregation sites like Digg, were made with young adults in mind. 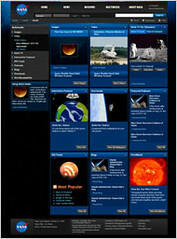 NASA’s been providing great content for years now, but the addition of widgets and features like MyNASA will make the site even more user friendly, and allow users to stay abreast of favorite missions or research projects. NASA evolved from its predecessor, the National Advisory Committee for Aeronautics (NACA), which was formed by Congress in 1915 to undertake, promote, and institutionalize aeronautical research. During the past 50 years, NASA’s aeronautical research has provided breakthrough concepts, tools, and technologies to make air travel more safe, efficient, and environmentally friendly…. There is a great link on the NASA aeronautics website where you can click directly on sections of a commercial plane to learn more about NASA’s contributions to aviation design and safety: NASA Aeronautics Research Onboard. This entry was posted on Monday, December 3rd, 2007 at 6:57 am	and is filed under Cool Stuff. You can follow any responses to this entry through the RSS 2.0 feed. You can leave a response, or trackback from your own site.